The rates of the used instruments are displayed in the "Market Watch" window. In this window you may see current Bid, Ask and Time of the quotation. Moreover, by right-clicking on the tabs, you this table may arrange columns and customize columns and rows. By right-clicking on the “Market Watch” or “Navigator” windows (in the “Instruments” section) or pressing F8 on your keyboard, as well as through the "Trade" option from the main menu, you can select “Instruments” command to edit the list of the used instruments. 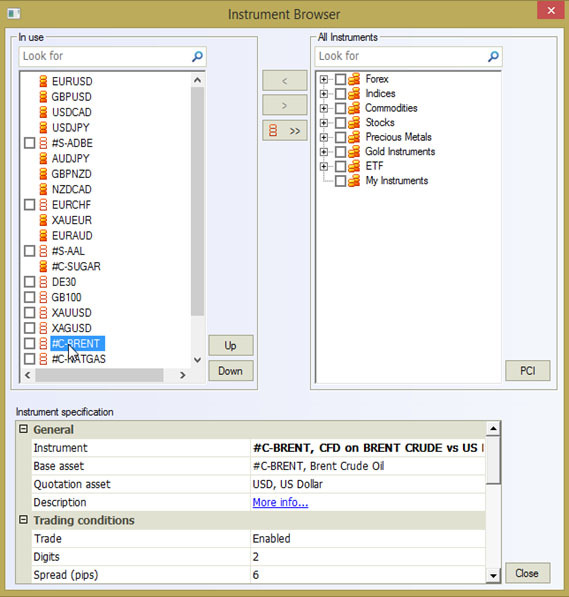 On the left there is the “In use” section, containing instruments from the “Market Watch” table; moreover, the instruments marked with a color mark indicate that there are open positions, orders or created charts on these instruments (the rest of the instruments are marked with an empty square). On the right there is the “All instruments” section, containing the hierarchical base of all instruments, which are divided into categories (groups of instruments); moreover, instruments with a special green mark are already presented in the list of the used instruments. 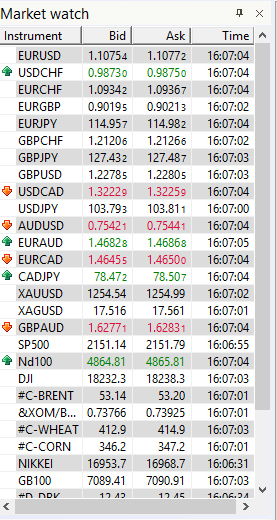 Below there is the “Instrument specification” section with 4 blocks of information about the instrument marked with the left-click mouse button (in the picture it is # C-BRENT) – “General”, “Trading conditions”, “Trading time”, “Swap”. See the list of the used instruments. See the entire hierarchical base of instruments. Search for the instrument you need both in the list of the used instruments and throughout the database; moreover, this search can be carried out by indicating only a part of the instrument name, for example, by specifying the substring "EUR" in the search box, a subset of all the instruments containing this substring will appear. Disclose the full specification of any instrument. Delete an unnecessary instrument form the list of the used instruments. Add the instrument or the group of instruments you need from the database to the list of the used instruments. Arrange the instruments in the list of the used instruments in the order you want. The process of adding or deleting the instrument from the list of the used instruments is very simple – you can mark the instruments you need (put a label in the checkbox on the left) and click the transfer arrow to the left or to the right, you can also put the cursor on the instrument and move it by holding the left-click mouse button. Additionally, you can remove all the used instruments from the list by clicking the special button with two arrows.